Because of farming over many years, fertilizer had been washing into Barrett’s Run Creek, causing degradation and loss of wildlife. 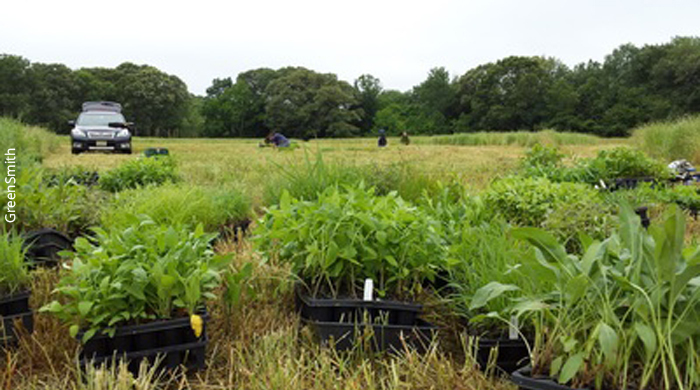 The project was funded by a grant to the American Littoral Society from the National Fish and Wildlife Foundation’s Delaware River Restoration Fund, partnering with the William Penn Foundation and with support from the U.S. Fish & Wildlife Service. The parcel received upgrades that include reforestation buffers, deer fencing and native plantings covering the entire acreage. A riparian buffer was also installed to protect the stream. “The first planting consisted of over 500 trees down there in October, giving us good coverage,” said Godshall. Buffers can remove up to 90 percent of loose soil and pollutants in stormwater runoff. Deer fencing was added to protect the small trees until the buffer was fully established. “We also installed walking trails through the buffer so folks can access the area which we ultimately envision will be contiguous with other trails and even the Amish Market, a well-known destination in our area,” said Ritter. Benches and two gazebos were installed to help create an outdoor “living classroom” adjacent to Hopewell Crest School so students and teachers can walk back to the park and observe foliage, animal life, write poetry or draw and paint, and conduct some lessons outdoors. The improvements have facilitated a proliferation of wildlife returning to the acreage, including bald eagles that have made their home in the park, red tailed hawks, and a wild turkey population. The state-listed Savannah Sparrow and Grasshopper Sparrow have also been sighted. Much of the rest of the acreage is currently being leased out to farmers, but the long term picture envisions a larger park that may include sports fields, playgrounds and other community areas. “It is like a little oasis. It’s so peaceful. We’re so proud to have contributed to making it that way,” Bello said. Cheryl Vosburg is a writer at GreenSmith Public Affairs. Previous articleN.J. leads the nation in Superfund sites. Now Cory Booker can do something about it.